Compare us like-for-like and we'll endeavour to UNDERCUT any other written quote you may have. We often quote up to 30% cheaper than our competitors. Manufacturer's Prices - Coming to us directly will save you money! Our prices are sensible because we have relatively lower overheads than our direct competition, and no middlemen. Trust and Experience - We've been in business for 40 years and have installed many thousands of kitchens - so we know from experience what customers value the most. That includes first-class customer service. Variety and Quality - Our Price Promise Charter covers all types of fitted kitchens, traditional and modern; and high-quality workmanship is never compromised. We design, build and install a wide range of kitchens. 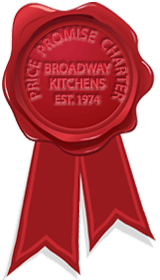 Whatever your budget, if you'd like a beautiful kitchen at a sensible price, trust Broadway. FREE kitchen design service - Ask to speak to our Senior Designer to secure your Broadway Price Promise and FREE design consultation.